Download this anti-SOA mini-poster for free, as part of Top Pun's campaign to close the School of the Americas, School of Assassins, Western Hemisphere Institute for Security Cooperation (WHISC), or whatever else you want to name it -- It's all in the WHISC! Different Names, same shame! Hang this anti-SOA poster in your home or office. Share this free poster with friends and enemies alike! Close the School of the Americas! Free downloadable anti-SOA Posters require Adobe Acrobat Reader to view and print. 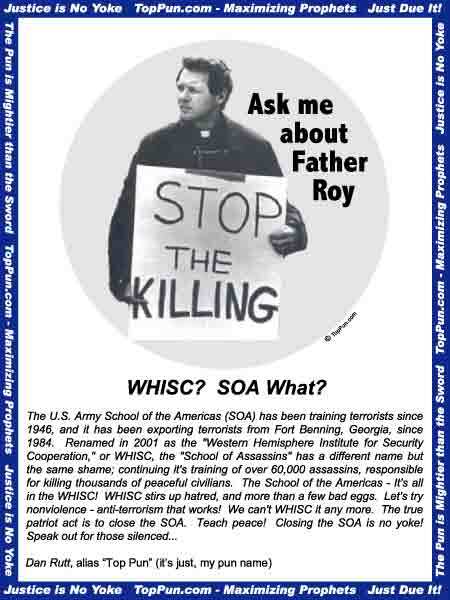 Download "8-1/2 X 11" Free Anti-SOA Poster - "Father Roy"
The U.S. Army School of the Americas (SOA) has been training terrorists since 1946, and it has been exporting terrorists from Fort Benning, Georgia, since 1984. Renamed in 2001 as the “Western Hemisphere Institute for Security Cooperation,” or WHISC, the “School of Assassins” has a different name but the same shame; continuing it’s training of over 60,000 assassins, responsible for killing thousands of peaceful civilians. The School of the Americas – It’s all in the WHISC! WHISC stirs up hatred, and more than a few bad eggs. Let’s try nonviolence – anti-terrorism that works! We can’t WHISC it any more. The true patriot act is to close the SOA. Teach peace! Closing the SOA is no yoke! Speak out for those silenced. Top Pun is the unofficial outfitter for the effort to close the SOA School of the Americas. Please feel free to download these free posters and pass them along to others. If you like these free posters, try these free anti-SOA wallpapers. Download free anti-SOA stuff for all!